You are here: Home / Reviews + Giveaways / Giveaways / California grown flowers review and HINT CARDS! California grown flowers review and HINT CARDS! I was sent a beautiful bouquet of California grown flowers for review and to introduce my readers to these beautiful flowers! Did you know that 75% of all US grown flowers come from California, however they account for only approximately 25% of all cut flowers actually sold in the United States. The remainder is imported from South American countries. · Meet the strictest growing standards in the world. · Were raised in a world-class, year-round environment perfect for growing hundreds of varieties. · Were most likely still in the field just 24 hours before you purchase them and therefore are much fresher and will last longer. The CCFC is an organization representing more than 275 cut flower and foliage growers from San Diego to the Oregon border. The Commission is uniquely focused on growers and helping them to thrive in order to ensure consumers in the US have quick and affordable access to the freshest, highest quality flowers possible. For more information about California cut flowers, visit www.ccfc.org, and to learn more about the benefits of buying locally grown agricultural products – including flowers – check out www.californiagrown.org. 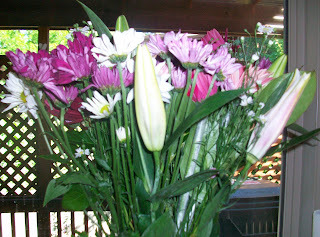 The flowers I received were absolutely gorgeous, and very fresh. They opened up beautifully and lasted a long time. I proudly displayed them for a couple of weeks! As the saying goes, “April showers bring May flowers.” However, in a recent survey conducted by the California Cut Flower Commission, (CCFC), we found that 42% of women don’t receive flowers as often as they would like. That’s why the CCFC has come up with a “Hint Card” to help deserving moms, drop a hint to that certain someone that they would like to receive a beautiful bouquet of the world’s freshest flowers, California Grown flowers! These Hint Cards incorporate a little romance or a little humor and are the perfect size to be left under pillows, inside lunch bags, stuck on mirrors, tucked in billfolds, placed on plates or just delivered from hand to hand. My husband is usually pretty good about giving me “just because” flowers, but I still think that they all need hints. They are really cute and hopefully your loved one will “get the hint” (and you won’t just have to blurt it out in frustration) that you would really love some flowers!